PROMOTES INDEPENDENCE AND EMPOWERMENT/PRIDE - Youth who primarily and statistically carry more stress relating to the economic situation of their parents are more likely to be a victim of circumstance. A bicycle, when used responsibly can give youth the ability to better take care of themselves when a home situation is less than ideal. PROMOTES COMMUNITY - Studies show that empathy and situational understanding is an extremely powerful tool in community development. When you support your neighbors through a rough situation, they in return hold that instance as a reminder of how to treat others. This theory is not absolute but holds the ability to highlight community progress through working together and sharing the same goals for a safer and more economic steady community. We are proud to announce that in 2019, the Starts with Arts Foundation will be reviving our Kickstart the Arts campaign! 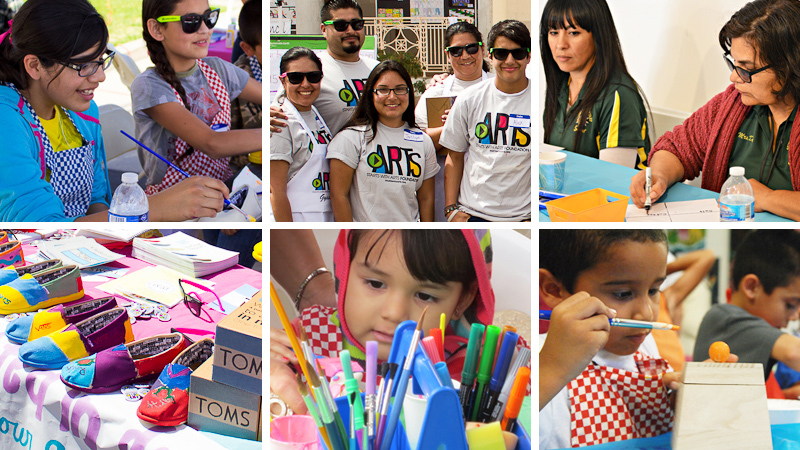 Starts with Arts and its participating artists and educators will be visiting schools and programs throughout the Imperial Valley conducting free art workshops and lessons in creative problem solving and arts education to kids K-12th grades. We need the help of our community, friends and family in order to purchase art & school supplies needed for our free workshops and future community events. Join me in supporting the Starts with Arts Foundation! This #GIVINGTUESDAY I'm raising money for Starts with Arts and your contribution will make an impact, whether donating $5 or $500. Every little bit helps. Please visit our website and donate on Tuesday, November 27th. All proceeds directly benefit the Starts with Arts Foundation and its youth programs in the Imperial Valley. THE FINAL FUNDRAISER AND EVENT OF THE YEAR IS HERE! THE HOLIDAYS CAN BE STRESSFUL AND TOUGH TIMES FOR EVERY FAMILY IN THE IMPERIAL VALLEY. MANY KIDS GO WITHOUT CELEBRATING THE HOLIDAYS WITH THEIR FAMILIES. WHAT BETTER TIME TO SPREAD SOME HOLIDAY CHEER AND GIVE BACK BY SURPRISING KIDS IN THE IMPERIAL VALLEY WITH BRAND NEW BICYCLES. FOR A LOT OF KIDS, THIS IS THEIR FIRST AND/OR ONLY GIFT THEY’LL RECEIVE - LET’S MAKE IT A SPECIAL ONE FOR THEM. HELP US GIVE BACK AND SUPPORT OUR COMMUNITY. BICYCLES RANGE FROM $50 - $100 BUT FEEL FREE TO DONATE ANY AMOUNT TOWARDS A PURCHASE OF A BICYCLE. THE STARTS WITH ARTS FOUNDATION IS A REGISTERED 501(C)(3) PUBLIC NON-PROFIT. ALL DONATIONS ARE ELIGIBLE FOR TAX DEDUCTION. DONATION RECEIPT AND NON-PROFIT STATUS UPON REQUEST.